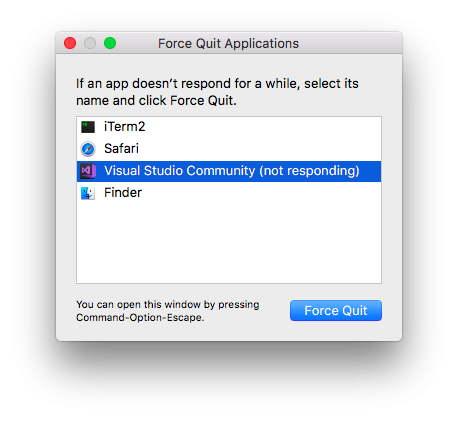 Today I updated Visual Studio for Mac with the new version for iOS 11 and my mac. After that Visual Studio is not usable anymore. I can open it but if I try to open a solution or create one, it's stuck on Update resources. The only way is to force quit. I could not reproduce this issue from your description. I just updated to the latest stable with support for iOS 11 and was able to create a new Xamarin solution without issue. Did you update XCode as well? ps -ax | grep "VisualStudio"
Attach the new IDE logs. Thank you @JGoldberger. Unfortunately, I reinstalled Visual Studio and not it is working. In any case, I updated also XCode. Glad to hear it. If you experience the issue again, please do collect the logs as indicated so we can investigate. Thanks!